Love deposit bonuses? Most players do. After all, who doesn’t enjoy making a deposit and getting bonus cash after meeting a playthrough requirement? It’s basically free money – and it’s only available online. But there’s something big offered at Silver Oak Casino for large depositors – something that is even more impressive than deposit bonuses. They’re called Cash Back bonuses and they’re very lucrative if you’re depositing thousands of dollars at a time. When you make a deposit of $1,001 or more, you can choose a deposit bonus or opt to receive cash back at some point in the future. Used to playing in a live casino? Then you’re probably used to receiving token plastic watches for putting in hours at the tables. Or, if you’re lucky, a free buffet hotel room. What you really want is free cash, but you can’t get it. Not, of course, unless you play at Silver Oak Casino. If you deposit between $1,001 and $5,000, you’ll qualify for a 30% cash back bonus. 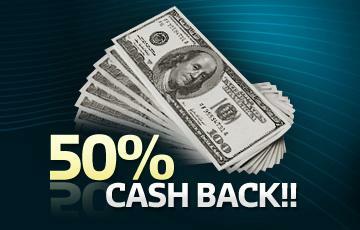 Depositing between $5,001 and $10,000 nets you 40% cash back. And if you’re a high roller intent on depositing $10,001 or more, you’ll qualify to earn 50% cash back. That’s a big deal, so if you’re a high roller it’s worth considering avoiding the initial deposit match bonus that’s offered to new players. You should note that these deposit limits are pretty high, so first time depositors definitely won’t be able to qualify when they first open their account. What’s more, a lot of credit cards don’t let you deposit that much money in one shot, so you’ll need to use a payment method that accepts large deposits. The cash back bonus comes with a minimum 30x wagering requirement, with each $1 wagered on Blackjack and video poker counting as $0.50 wagered towards the bonus. The cash back bonus is calculated on all deposits made over the previous 7 days, so keep that in mind too. Remember, you’ll need to make a deposit of at least $1,001 to qualify for the cash back bonus. If you’re planning to deposit smaller amounts, don’t worry. There are big deposit bonuses available for you. For official Cash Back Bonus terms and conditions, make sure you check out our dedicated Cash Back Bonus page. And remember, if you ever have a question, we’re always around to help through live chat, toll-free support, or email.